Pocketable Brochures - Flottman Company. Our customer wanted to include detailed information about local attractions, but also wanted the finished pieces to be easy to carry and hold on to while traveling. 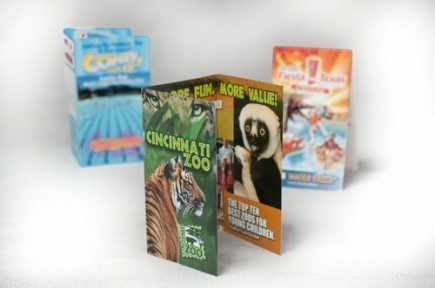 Create miniature folded brochures with multiple panels to allow for maximum copy space while maintaining a small finished size. The brochures include all relevant information about each tourist attraction, while still including large and bright imagery throughout. The finished sizes of 3 1/2″ by 2″ fit easily in pockets, wallets and purses. At Flottman Company we’ve mastered the ability to design folds to add panels, allowing for increased content space. Our miniature folding capabilities are perfect for projects such as this where customers face copy/space issues. The pocketable brochures shown here are mini travel guides for destinations throughout the Midwest. Since these pieces are designed for tourists, our customer wanted to be sure that they could be easily carried by travelers. They also wanted to include enough colorful imagery to catch the audience’s attention and enough copy to fully explain the features and benefits of each attraction. Miniature folded pocketable brochures proved to be the perfect solution to this customer’s challenges. These unique pieces are printed with captivating imagery, special offers and a definitive call to action. They were created using a variety of formats, including top folds, side folds, 3 panel roll folds and accordion folds. The finished size of these pieces is 3 1/2 ” by 2″, making them perfect for placing in your pocket, wallet or purse. The open sizes vary from 3 1/2″ by 8″ to 7″ by 2″, so they are easy to manage and use even when opened. 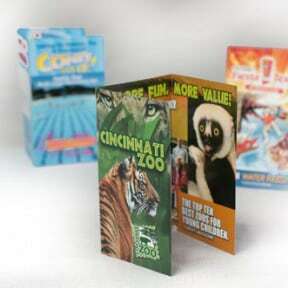 These information cards were distributed in hotels, restaurants, convention centers and information centers. They highlight over 150 different attractions, entertainment spots, shopping centers and dining experiences. Their small size and focused information make them the perfect resource for travelers. Want to talk about how pocketable brochures can help you? Request a quote today!